Despite the name, this video slot is not an homage to the old and forgotten Burt Reynolds’ b-movie. Shaark! is, simple, an overall homage to all films that featured shark-inspired mayhem. Just as you can safely watch sharks on TV, you can do the same when you hit the spin button on this online slot game. The presence of a shark is going to be appreciated here since the sleek creature could yield quite a nice payoff. The Look, Style, and Design of Shaaark! The visual style of the game is more akin to humor than horror as the colors are bright and upbeat. Not surprisingly, the backdrop of the game is a beach and a screaming woman in the corner is clearly screaming “Shaaark!” So, now we know why there are three a’s in the title. Once we get the spin symbols, the fun nature of the game reveals itself more. A unsuspecting man on an inflatable inner tube and a very nervous seal both get off a lot luckier than whoever was riding the chewed up surfboard and the number plate from a presumably sunk boat. Do not fear the shark, though. He’s your friend. Once the shark shows up, you have a wild symbol to take advantage of. The nefarious shark fin shouldn’t bother you much since the fin reflects the scatter symbol. Again, sharks are perfectly fine when you check them out from a safe distance or they turn up on a cool online slot game. The five-reel slot game comes with 25 paylines. That means you could play as little as one line or put wagers on as many as all 25. The minimum bet is .01 and the maximum is $10. You can only place once wager per line and, once again, there is nothing stopping you from wagering on the remaining 24. You are always capped at the same minimum and maximum line bet. Five shark symbols mean you get the highest jackpot payout, which is 4,000 coins. If five “man in the inner tube” symbols turn up, you walk away with the second highest jackpot of 1,000 coins. Sorry, there is no progressive jackpot and that is one of the negatives associated with the game. The shark symbol is your wild and it could help you pull out an unexpected payoff at times. When two or more shark fin scatter symbols turns up on any of the engaged reels, scatter payouts are the reward. Scatter payouts are achieved through the multiplication of the total coin bet into usable credits. 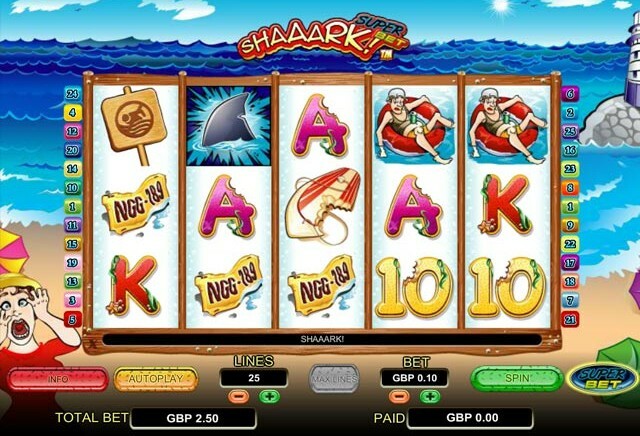 Three or more shark fins on any of the engaged reels gives you a full 10 free spins. Better yet, those spins could with a double payout. Even with this generous offer, the hits keep on coming. Three or more scatter symbols that turn up on the reel during the free spin means the scatter feature is triggered again. The software employed to create Shaaark! does more than present outstanding graphics and visuals. For one, the speed in which the spins take place can be set. If you are in no rush, you can max out the duration at 2 seconds. Do you want to keep moving? Set the spins to .25 seconds. Auto play technology is available allowing you to set anywhere from 5 to 500 spins in advance. Consider this another way to speed up the game and get more out of it. Shaaark! is more than just a cool and fun game. The game offers the ability to win and win big. Finding a more generous slot game would be pretty tough.